Yesterday, my husband and I saw the new film “The Music Never Stopped” here in Kansas City. (See the trailer here.) This film is based on a case study described by the neurologist Oliver Sacks, concerning a man named Gabriel who has significant memory impairments from a brain tumor. After the tumor is removed, Gabriel is left barely interacting with the world around him. He is placed in a long-term care facility, where the nursing staff and his parents discover that he comes alive when he hears the popular music of his youth. The father, Henry, gets a music therapist involved, and through music – both extensive listening with his father and interventions by the music therapist – Gabriel begins to reconnect with the world around him and, most importantly, deepen his relationship with his father. Since this film is about the powerful connection between music and memory AND a central character is a music therapist, this film has made big news in the music therapy world. I was very pleased with how music therapy was portrayed in this movie. We really only get to see two direct interventions by the music therapist, including the use of recorded music in an assessment of the extent of Gabriel’s memory loss and the pairing of rhythm on a tambourine with new information to improve functional memory. I felt these were portrayed in a real, plausible way. The central story, though, is how Henry begins exploring the music of Gabriel’s youth so that he can connect with him in the present. The emotional weight of this film comes from this relationship between Henry, Gabriel, and the music that brings them together. 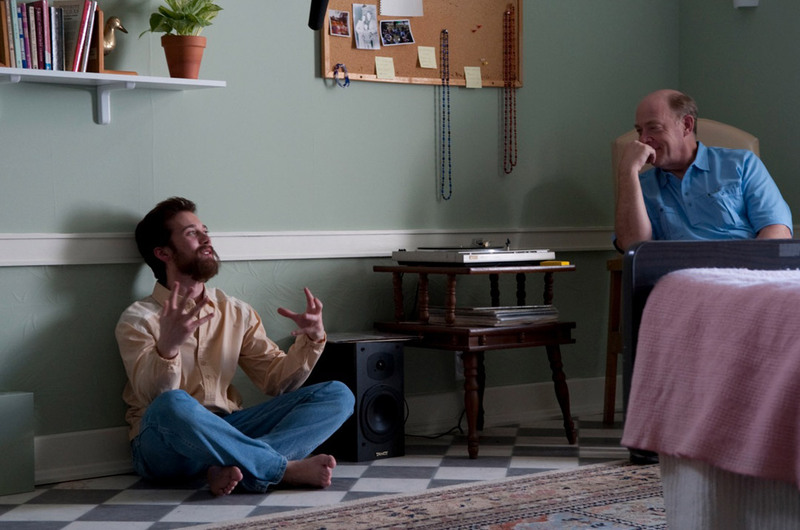 (We do see the music therapist explain to Henry why he has to connect with his son through Gabriel’s music, not his own preferred music.) While this doesn’t fall directly under the label “music therapy,” it does demonstrate the ability that music has to bring people together in a powerful way. Music can draw out memories. Music helps to build and strengthen relationships. Being in music together can have a huge emotional impact. Client-preferred music may often be what has the biggest impact. The music therapist can work together with the family in using music to help a client/loved one. In other words, while music therapists do have specialized experiences and applications of music to share, we are not the only ones who can use music to benefit a person. What results is a powerful, feel-good movie that reminds me of how lucky I am to be a music therapist! Have you seen “The Music Never Stopped” yet? What did you think? Great Rachelle! I saw this movie too and thought it was great! I was pleased with how MT was portrayed, and thought how music was portrayed in this music was incredibly powerful. I’m glad you had a chance to see the movie, Caylyn. I hope many more people get to see it, too!